Want to explore primary source material, watch public films, and browse through a collection of historic treasures? 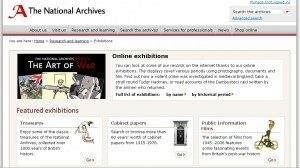 Check out the online exhibitions from the British National Archives. You’ll find hundreds of pages of photographs, government documents, and other resources. It’s like browsing through a museum without leaving your house. The Art of War – British propaganda creations from World War II, including many public information films. Secrets and Spies – A look at some of the spies and secret codes that shaped British history. Treasures from the National Archives – View dozens of original documents organized by historic period. You’ll want to spent some time browsing through the resources on your own; there’s a lot to be discovered.